For Joan Nathan, food is a connector, allowing those of different generations and cultural traditions to come together in eating, and in understanding the culture behind the food. For Nathan, the value of food is quite personal as well. 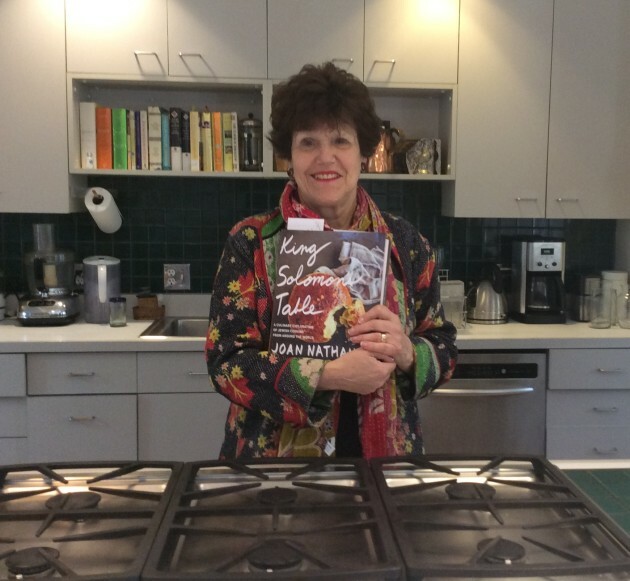 When Nathan went to see her 103-year-old mother, Pearl Nathan, in Providence, RI in February, she showed her mother a recipe for hardboiled eggs with spinach from her new cookbook, King Solomon’s Table: A Culinary Exploration of Jewish Cooking from Around the World. Pearl Nathan had not had a good relationship with her own mother, Joan Nathan says, which was a regret of hers. Seeing that her own daughter was carrying on her mother’s food traditions was deeply comforting to Pearl. She passed away the next day, and Joan told Lilith in a phone interview she is pleased that her work could bring her own mother comfort and satisfaction at the end of her life. In a recent meeting at the Bread Furst bakery near her home in Washington DC, Nathan talked about how her Passover seder guests have been varied—including former Ambassador Jeanne Kirkpatrick and retired NPR host and author Diane Rehm––and how she often attends authentic sedarim of Jews of different ethnic groups the second night of Passover. Though she has many restaurant-world connections–Alice Waters of Chez Panisse and Yotam Ottolenghi and Michael Solomonov provided blurbs for the new book––she does not like restaurants that are too loud, preferring the fellowship of guests coming around the table. She said she loves Friday night dinner as a time for people to enjoy the time to speak to each other. In all her work, though she researches recipes (she went to libraries in Oxford, England, to look at ingredient lists in Cairo genizah fragments and to the Yale University Library to look at Akkadian tablets from Babylon circa 1700 B.C.E with lists of recipes), Nathan finds inspiration in speaking with home cooks around the world and learning their stories along with their recipes. Many of her informants are female, and giving importance to the food culture they create is thus significant. Beth Kissileff How is your work a feminist project, preserving and valuing work and foodways and culture that primarily women connect to? Joan Nathan: Women have always been in the kitchen until the women’s revolution. It is a place where recipes are handed down from generation to generation. It is also place where people can talk, relax and have fun. And it is a place where culinary customs are sustained and strengthened. BK: Why is the seder both the hardest and most rewarding meal of the year? JN: My seder is very big…about 40 people…and it has many moving parts. First of all there is cleaning my house, which I try to do in a regular spring cleaning. Then there is not only making the meal, moving furniture, setting the tables, putting out the symbolic foods, making everything beautiful and trying to make people feel comfortable. It exhausts me but I am so glad that I do it. BK: Can you tell us about some memorable seders you have given and attended? JN: Every seder is memorable that I have made. Each one is different. What makes our seder different from most others is the play we give each year. It is always the same play for young people, but young maybe young in heart. We have 90-year-old actors. We have God, Moses, baby Moses, sheep, Miriam, etc. The actors raid my closet and take out costumes and it is so much fun. BK: How did you come to your unique blend of food writing with history and culture? Do you have peers in Jewish or non-Jewish world? JN: I was lucky I guess and I followed what I was interested in. When I visited Israel in 1970 I fell in love with the country and landed the best job in Jerusalem. As press attache to Teddy Kollek, the then mayor of Jerusalem, my job was to take journalists around the city and to peek into homes of all the citizens. I have been peeking into kitchens ever since! I have many peers, people I really respect in the Jewish and non-Jewish world—Claudia Roden, the sorely missed Gil Marks, Paula Wolfert, etc. BK: Where is your own family from and how does your interest in food traditions figure into your personal background? JN: My father was born in Germany and my mother in New York, of parents from Poland and Austro-Hungary. Since my father was a first-generation immigrant, I loved to visit his sister Lisl and taste the cooking at her house. And I loved the stories. BK: What is your Pesach menu this year? JN: Since I will be on book tour, unlike every year for the past 30 or so, I am not doing a seder, but going to my daughter Daniela’s home in LA. I am bringing three haroset recipes from my new book: the Ferrara one, a blueberry one from Maine, and a Persian one with pomegranate juice and pistachios. I will also make eggs with spinach, a very old and long-cooked dish that came to Ancona, Italy from the island of Corfu––from my new book. If I were at home, I would also make gefilte fish, matzo ball soup, brisket, lots of vegetables, including the quinoa and squash dish from my new book. For dessert I would make the flourless chocolate torte and so many other dishes from the book.